The development of media in Japan is largely due to its attempt to make itself better both socially and intellectually. Throughout Japans history, the elite members of Japan’s society have competed with each other socially by keeping most up to date with the latest theater, artwork, and literature. After the Meiji revolution, the government adapted Japan’s love for the arts into an easy, widespread, method to teach its people about history, politics, and political interests. Newspapers, magazines, and film emerged as the primary conveyors of goverment education policies. Now, a common pop culture -- and increasingly popular form of entertainment to the world’s youth -- is Japanese Animation (otherwise known as Anime). This form of entertainment is enjoyed as much as live action movies in Japan, and is widely accepted around the world. Anime is a blend of all the types of media used in the past (plays, han’ga, literature), applying fantasy to a lesson of the real world (though, as with all forms of entertainment, there is just plain entertaining animation). All of these types of media can be traced to being a teacher, or shaper of society. When one form becomes dull to the masses, another takes shape and pleases the mass market. The government, however, is the tool behind the machine. Utilizing mass media, the government of Japan is capable of spreading influence, arouse curiosity, and teach what is “necessary” to be taught.Though later arts, such as Manga, developed more in terms of social commentary, earlier arts like literature was made readily and cheaply available to the masses to allow the people to catch up with the rest of the world. Japan, as any country, has a rich artistic background, feeding the minds of its people with theater (Kabuki and Noh), paintings (Han’ga), literature, and modern film and feature length animation. There are, of course, many other types of entertainment available and produced in Japan. Not all, however, have an educational role in Japan as these do. Kabuki is the first style of theater for the public, giving it plenty of opportunity to express ideas and philosophies. The plays consist of people in elaborate costumes and make-up, combining large dance groups and interpretive music to tell a story. Noh, utilizing colorful masks to display expression, utilize much of the same properties of Kabuki, to tell of fantastic stories. Noh plays were considered theater for the upper class, and were used to portray ideas of honor and idealisms (Bushido for example). Han’ga, or, woodblock prints, is an art that uses many separate wooden blocks as a pressure plate for certain colors. Each block was crafted with the same picture on it, but only certain pieces of a certain color would be covered in natural inks, and pressed upon paper. After several blocks were pressed, a colorful picture was created, and available for mass production (a great feat, considering the lack of printing presses and other mass market media). Pictures of all sorts, from aesthetic to political, were pressed and disbursed for public enjoyment. Literature, as well, has played a large part in the teaching of Japan. As early as 1000 A.D., the Tale of the Genji was written; a story about court life in Kyoto. The written word, introduced from Korea, gave the Japanese the ability to converse to a large audience what was once only available to the few (though literacy was rather low when the first writings were made available). The Samurai and Noble class of Japan have always been ones to compete with each other in aspects of art, politics, and wealth. The social elite would go as far as being the first to buy a new book or painting from the latest, and greatest, artisans. The richest of them would even buy new clothes every day, just to show their wealth. In this fashion, the elite were also the most common to attend theatre, or attain the best art. The government of the time, knowing this very well, was able to use these forms of media to influence the money and people in Japan, and allowed the government to control the media as it is today. News papers, as well, have found a home among the Japanese social elite, and have become (in modern Japan) a daily part of life for most Japanese. Lastly, is the modern film of Japan. A common pop culture, and increasingly popular form of entertainment to the world’s youth, is Japanese Animation (otherwise known as Anime). This form of entertainment is enjoyed as much as live action movies in Japan, and is widely accepted around the world. Anime is a blend of all the types of media used in the past (plays, han’ga, literature), applying fantasy to a lesson of the real world (though, as with all forms of entertainment, there is just plain entertaining animation). All of these types of media can be traced to being a teacher, or shaper of society. When one form becomes dull to the masses, another takes shape and pleases the mass market. The government, however, is the tool behind the machine. Utilizing mass media, the government of Japan is capable of spreading influence, arouse curiosity, and teach what is “necessary” to be taught. Kabuki (originated in 1600) and Noh (1300’s, “perfected in early 1600’s) plays are distinct more in their appeal to taste and class than in execution. Kabuki, as stated above, is a common style of dance and music, meant to appease the masses. Like geisha, kabuki was enjoyed by the social inferiors, and had the ability to coerce great public interest. As more and more people came to watch the grand productions, the government found more and more reason to restrict it, and make the plays more socially acceptable. One instance of government intervention is the removal of women from kabuki:. “Early Kabuki was much different from what is seen today and was comprised mostly of large ensemble dances performed by women. Most of these women acted as prostitutes off stage and finally the government banned women from the stage in an effort to protect public morals, just one in a long history of government restrictions placed on the theater. This ban on women, though, is often seen as a good move because it necessitated the importance of skill over beauty and put more stress on drama than dance, putting Kabuki on the path to become a dramatic art form. Another development was the appearance of onnagata female role specialists, men who played women.” (Johnson, Internet) . This interceding of government into media is a beginning to how government would later assert its control. 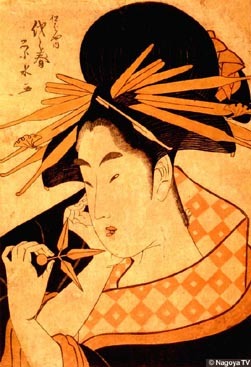 This change in Kabuki plays was viewed as a good change, as it helped in lowering prostitution, increased the “value” of the plays, and potentially slowed the spread (if not potentially stopped) of certain diseases across the country..
Noh, however, appealed to a more social elite class, and considered off limits to the commoner. The Samurai class was the only class with enough time to enjoy such plays, the themes were directed at stimulating the samurai mind. Poetry, heroics, and divine beings (Kami) were the usual themes, offering the samurai a glimpse into the eternal happiness available for them though Bushido and Shinto practice.. The development and attendance of Kabuki and Noh instilled a love for the aesthetic, and prompted visual crafts in painting and beauty. Han’ga were originally designed as a type of mass media to promote Kabuki and Noh actors, but gradually became an art form of its own. The shift to this new aesthetic brought with it a new title. Though still (in 1660) han’ga, a more direct term was applied to pictures of beauty and message- Ukioye or “floating world pictures.” Through use of the mass production of these prints, people were able to visualize stories and see fantastic places otherwise unable to be viewed through words alone..
“Prints could now be obtained by the public of Japan for a few cents, and I can see in fancy what a change this new art must have brought into the life of common people, for all in this Land of Yamato have always been ardent lovers of the beautiful… For a few cents they could now read the history and mythology of their country in beautifully colored pictures, look upon scenes in far-away places, and, joy of joys, see freely, though in pictures, the plays of the theatre!” (Priestly, 31-2) . Politics, history, philosophy… all manners of ideas could be portrayed through the use of colorful pictures, and Kan’ji (Chinese characters) to explain its meaning. Capable of wide distribution through merchants, Ukioye became Japan’s first mass media for all to see at minor expense so that even the poor could view them.. Literature in Japan is the most dominant source of media within the country. Early in Japan’s literary history, only the elite were capable of reading and writing. When the first book was written (Tale of Genji), the wealthy land owners in Kyoto were, for the most part, the only capable readers. Though the common people eventually learned to read (a must in order to enjoy Han’ga or read new laws set in place by the government), it wasn’t until after the Meiji restoration that public schools became free to the public in 1900. There were problems with this system, however. Children did not attend school regularly, and textbooks were considered too hard for a developing community, as well as viewed as boring by the children trying to learn from them. A natural response to these cries was to invoke, and stimulate, the imaginations of the Japanese people. Around this time, the government, through use of printing presses, allowed foreign books to be translated, and new books to be written, for the stimulation of the Japanese people. The Meiji restoration pushed the Japanese government to see that progress was necessary, and that the country was far behind technologically and educationally. The government promoted projects such as color coded books (for easy reference to material type. Blue for literature, green for philosophy, etc…), and stars for cost (one star being cheapest, five being most expensive). The books themselves were the size of what Americans refer to as pocket books. . Through the government pushing education, and the people grasping at the new freedom of thought, the county became a country of absorption. Today, over seventy-million news papers are produced and read in Japan every day. That is second only to Russia which produces one-hundred-sixteen-million. Over one billion books are printed each year in Japan, and almost three billion magazines are published and read monthly. In addition to this, about one hundred titles are printed every year for consumers to read (Statistics- Kazuhiko). Historically, though, newspapers were the first mass media directly effected by government influence (as they controlled the censorship and publications). The immediate use of newspapers was the greatest m.eans available..
“Even though the number of people who had access to information carried by newspapers was still limited, it was the only means by which the authorities could reach the people except for the institutions which were under its direct control. A letter from the government which was sent to various publishers four years into the Meiji era bears the testimony to the weight Japan’s new leaders attached to the newspaper as a medium through which it could educate the people:” “Newspaper publishers should make it their purpose to develop the knowledge of the people. The way in which this can be achieved, is by helping them overcome their stubbornness and narrow-mindedness, and showing them the way to civilization and enlightenment.” (De Lange, 34) . Today this goal has become a reality. The newspapers print out news and spread it openly to the public. Newspapers worked at creating furigana (Japanese characters to help readers understand kan’ji). In essence, newspapers helped to drive the learning capability of Japanese society more than any other means of its time. To this day, Japan has one of the highest literacy rates in the world, all because the government pushed for its people to catch up to the rest of the world..
Latest of all the media types is television and cinema. As in the United States, television is a commodity of great use, as it not only provides visual and audio news capabilities, but offers an easy outlet for relaxation and entertainment. One does not need to use the imagination to create the world when it is visually created for you in high color and beautiful animation. In Japan, television has been given to dominion of the Zaibatsu. The one company in particular is Nippon Hoso Kyokai (NHK), who has government backed rule of the airwaves. Private companies driven by commercial income also have a small stake in the media, but do not have as much government backing as NHK..
Over three hours a day is spent watching television (on average) by the Japanese. Whether it is morning animation, or daily news, people are watching television from 7 AM to a little past midnight. NHK pumps out 70% of its air time dedicated to educational use. NHK leaves the entertainment to private companies who deal out 40% entertainment, 24% cultural, and about 19% informational. The remainder time is spent on commercials (which NHK does not deal with since government funded).. In cinema, after the Meiji restoration, directors were given free reign over their work… for a short time. It wasn’t until after World War 2 that directors were given complete freedom in their works. However, its was early in the 1900’s that anime came to be. Anime originally was created from Japanese comics called Manga, where full stories are printed out in rich color for reading (much like Ukioye mixed with the fantasy of Japanese literature). In 1914, the first manga was animated, creating Momotaro, only to be followed in 1932 by the first talking anime Chikara To Onna No Yononaka. The first color film was released in 1959, after WW2’s end, and the influence of America had well taken root. Anime in Japan initially was used as many cartoons as Popeye were used in the United States. Teaching of numbers, letters, and, most importantly, morals. After WW2, however, the tone of anime as a whole changed in response to the devastation of Hiroshima and Nagasaki.. Initially, these film animators used romantic adventures and science fiction stories as an allegorical expression of the significance of Japan's defeat in WWII. The recurring themes of struggle, survival and rebirth echo in the background. However, upon the advent of the Industrial Revolution, animators made the transition from a theme of historical defeat to one of technological optimism. Technology was (and is) Japan's friend and has catapulted the country into one of the world's biggest superpowers. (Internet) . Anime, from Japan, has become an incredible medium, expressing the beautiful art of Han’ga, the imagination of Japanese literature, the entertainment of Kabuki and Noh, meshed it all together, expressing history, culture, and ideals of Japan and all that has influenced it. . In America, television and books are more for entertainment value, with comedy spreading through late night, or prime time, like wildfire. Japan, however, uses television and books as a means to catch up, and excel in the world. Media slowly formed itself into the aesthetic, into the affordable, into the appealing, never taking a rest in its goal to educate the masses. The government pushed for its citizens to learn as much as they could in order to better themselves technologically, and as a recognized member of civilized society. The origin of Japan’s drive for greatness, however, has its roots deeper in history than the modern push from the government. Japan’s court in Kyoto started the drive for the elite lifestyle and the “Japanese Renaissance.” The rich elite would push each other constantly to strive to be better than before (and more so, better than their neighbors). In this respect, Japan still continues to strive for greatness. It is simply amazing how, starting from simple wood block prints, a pop culture has developed in Japan that has gained popularity in the entire world. This art form is a strong teacher for native Japanese (with movies like Rurouni Kenshin) and foreigners alike (with movies like Grave of the Fireflies). Media in Japan has reached that pinnacle that the Meiji government strove for in the first place- it helps the masses better themselves, and is entertaining enough to keep them wanting more and more for continued improvement..
De Lange, William. A history of Japanese Journalism. 1989 William De Lange, Curzon Prezz Ltd.
Huffman, James L. Creating a Public. 1997 University of Hawaii Press. 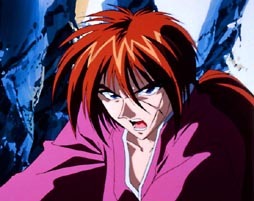 Kazuhiko. Goto Facts About Japan: Mass Communication. 1990 International Society for Education Information. Passin, Herbert. Society and Education in Japan. 1965 Teachers College Columbia University. Priestly, Ana Freeborn. How to know Japanese Colour Prints. 1927 Doubleday, Page and Co.